TOLEDO, Ohio, April 19, 2018 – SSOE Group (www.ssoe.com), a global project delivery firm for architecture, engineering, and construction management, announced today that eight of its employees earned professional certifications during the second quarter of SSOE’s 2018 planning year. Attainment of professional licensures and certifications is strongly encouraged at SSOE. In fact, the company covers the expense of preparation classes and exam fees as well as provides paid time off to take the exam. As an added incentive, once an employee has passed an exam, they are awarded a recognition bonus. PMP® certification, awarded by the Project Management Institute (PMI), indicates that an individual possesses the knowledge and skill necessary to lead and direct project teams, and delivers project results within the constraints of schedule, budget, and resources. Raza Ansari, EI, PMP, Assistant Project Manager, recently earned his PMP certification. A University of Toronto graduate with a Bachelor of Applied Science and Engineering in Electrical Engineering, Raza works in SSOE’s Toledo, Ohio office. He specializes in project execution analysis and vendor / subcontractor coordination, supporting the firm’s automotive manufacturing facilities operations with his more than 5 years of experience. Scott Hazen, PE, PMP, Project Manager, recently earned his PMP certification. A Michigan Technological University graduate with a Bachelor of Science in Civil Engineering, Scott works in one of the firm’s two Birmingham, Alabama offices. He specializes in cost reduction, purchasing strategies, and developing innovative solutions with suppliers, supporting the firm’s construction management division with his more than 30 years of experience. EDAC certification, awarded by the Center for Health Design, indicates that an individual has in-depth knowledge of and the ability to practice evidence-based design, a process that involves developing design solutions rooted in research to help achieve a client’s goals. Certification is awarded upon successful completion of the five-section exam, which tests an individual’s understanding of evidence-based design as it relates to healthcare, the research and pre-design process, construction, and occupancy. Jennifer Bohn, RA, EDAC, LEED AP BD+C, Senior Architect and Medical Planner, recently earned her EDAC certification. A Lawrence Technological University graduate with both a Bachelor of Science in Architecture and Master of Architecture, Jennifer works in SSOE’s Troy, Michigan office. She specializes in coordinating projects from schematic design through substantial completion, supporting the firm’s healthcare, commercial, and education operations with her more than 10 years of experience. CHST® certification, awarded by the Board of Certified Safety Professionals, is designed for individuals who demonstrate competency and work in health and safety activities devoted to the prevention of construction illnesses and injuries. Certification is awarded upon successful completion of the 200-question exam, which tests an individual’s understanding of program management, worksite auditing, training, and professional understanding as it relates to construction health and safety. Robert “Scott” Goodwin, CHST, Corporate Safety Manager, recently earned his CHST certification. A Fairmont State University graduate with a Bachelor of Science in Safety Engineering, Scott has served as an active volunteer firefighter since 1984, with more than 30 years of experience in safety. In addition to supporting SSOE’s 1,200+ employees in 20+ offices in 6 countries in his role as Corporate Safety Manager, he also serves as Lieutenant Firefighter for Ballville Township, Ohio. When not traveling to SSOE’s various office locations and project sites, Scott works in the firm’s Toledo, Ohio office. 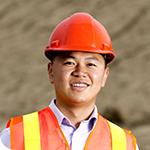 To receive Occupational Safety and Health Administration (OSHA) 10-Hour Construction Industry certification, an individual must complete the 10-Hour Construction Industry Outreach Training Program, which is intended to provide an entry-level construction worker with general awareness on recognizing and preventing hazards on a construction site. SSOE requires the OSHA 10-hour certification for all technical employees. Sam Thurber, PMP, Senior Project Manager, recently earned his OSHA 10-hour Construction Industry certification. A University of Toledo graduate with a Bachelor of Science in Electrical Engineering, Sam works in SSOE’s Toledo, Ohio office. He specializes in appropriation development, project implementation, and start-up, supporting the firm’s food and consumer products division with his nearly 30 years of experience. Cheryl Slone, Project Management Assistant, recently earned her OSHA 10-hour Construction Industry certification. Cheryl works in SSOE’s Lima, Ohio office and specializes in establishing and maintaining project filing systems and preparing submittals, supporting the firm’s food and consumer products division with her more than 20 years of experience. Aydin Salman, Senior Designer, recently earned his OSHA 10-hour Construction Industry certification. A Kalamazoo Valley Community College graduate with an associate degree in Tool and Mold Design, Aydin works in SSOE’s Kalamazoo, Michigan office. He specializes in developing master plans, equipment layouts, and sheet metal and machine detail designs, supporting the firm’s food and consumer products division with his more than 30 years of experience. Peter Nimmer, AIA, NCARB, PMP, LEED AP, Business Leader, recently earned his OSHA 30-hour Construction Industry certification. Peter graduated from DeVry University with a Master of Business Administration after graduating from the University of Illinois with a Bachelor of Science in Architecture. Peter works in SSOE’s Santa Clara, California office and specializes in managing complex projects and leading multidisciplinary teams, supporting the firm’s high-tech division with his more than 20 years of experience.